After what happened yesterday, when I saw that weather predictions in Chicago are still Thunderstorms for the day, I was worried what is going to happen. However, I was not as much worried as I was yesterday. However, given that I did take up a flight that gave me a 5+ hour layover in Chicago was an insurance. I started my day early and reached at the Airport at 7.15am. It was well in time and I did bring in the bag that I was leaving back yesterday. I did bring in some more of my clothes than I was thinking off. After checking-in the bag, when I reached at the Security counter, I met Alex. We first met at the Marriott last year, but he left the job in January and we have kept in touch via Facebook. We did talk about meeting up at the airport but his was a morning shift and yesterday I was going at noon. But, today I ended up being at the same spot where he had his duty. He did come up to meet me after his shift was over – it was nice catching up with him. I had a 2 hour wait at the MSP airport which got extended to 2.5 hours because the flight got delayed. Flight was initially delayed for an hour but luckily it was cut short by 30 minutes and we were airborne. I did watch Episode 14 of Season 8 for House MD. I had wanted to complete the series in US itself a couple of months back, but then I got hooked on to Lost and never got around to finish this series. This was an interesting episode where I found Gregory House (the lead character) take an unexpected turn. But, the way it ended, I have a feeling the Lisa Cuddy will break-up with House after what he said to Lisa. Next episode in the flight to India. I reached Chicago Airport in about 50 minutes of flight which was all smooth expect the last 10 minutes of turbulence. The plane taxied for 15-20 minutes at the airport and the attendant informed us that it had taxied at every taxiway that exists in the O’Hare terminal – that was something. I did notice that place crossed a bridge over roads and railroad tracks – that was cool (don’t get to see that happen in India). At the airport, I found my way to the Gate – K16 and once I had located the same, went over to Starbucks and got a Mocha and Banana Cake. I also paid up $7 for accessing internet at the Airport. I don’t know why people say it is free at the airport!! It is not. And, here I am – writing this blog post which will be updated when I arrive in Delhi. Time to go and find some other stuff to do on internet :). Enjoy this until I update this on other side of the planet. I don’t have to describe what “Responsibility” is; I assume we all know of it because in some form or other we do have responsibilities. However, many a times we measure our responsibilities in terms of the value of the object we are responsible of. Let us assume that we borrow 2 objects from someone – 1) A jewelry piece like a gold necklace worth 50K and 2) A travel bag worth 1K. If you ask yourself honestly a question – “how much will you be worried if you lose one of those items?”. I am going to make a generalized statement – “Most people would most worried about the necklace and not care so much about the bag.” And, by care I mean not just loosing it, but also damage, handling it and anything else that may cause harm to the object. Yesterday, I was presented with something similar. We borrowed a travel bag from a relative and as I planned to come back from USA, I figured out that the charges for me to carry that bag will be around $150. I instantly decided that it was not worth spending that amount of money on ensuring that bag gets back. It was decided that we will talk to the owner of the bag and if need be we will buy another one from India and simply replace it. Today, as I think of it, what would be the reaction is this was the case with a necklace worth 50K. I can safely say it would have been very different. So why does responsibility changes with the cost of the object. Thinking more deeply into the subject, I realize that it is not just the cost of the object – it is linked to the value of object for the owner. However, many a times we assume the value of the object based on how we value objects in our life. How many times have you considered an anniversary card that you received as just a card and misplaced it and not thinking that it valued so much to the person who gifted you; more so misplaced a present/card that someone else received because you don’t value care of the ones you receive. Do we care enough to ask the person if it is okay to let the thing be ask them of their opinion of the object and its value (not monitory, but importance) for them and then decide how we should make amends if anything should happen to it. And, I also tie this up to debts to the person. Taking something from someone and not returning it back for whatever reason or returning it back not in its original condition means like borrowing money and not giving it back or giving a partial amount back. It is just being in debt of the person forever however small it is. And all that counts up. So, I finally decided that I am going to spend the money and take the bag back to India and ensure that I am not in anyone’s debt no matter what it costs me. They handed me a bag and I was responsible of getting it back to them. More so, it ensures that I don’t let go of my sense of responsibility no matter how small the object it. It all started when Sahil started the thread to plan a trip to Mt. Rushmore during the week of July 4. After many hours of planning Sharad and Aum walked out of the trip and Sahil was not interested in doing it with just two people. So, I was left high and just wanted to go out of the home. My time to go back to India is near and I am just feeling a little off, just want to go back home and was in no mood of staying back at my apartment and watching TV for 3 days straight. So, I did some research and came up with a road-trip into Wisconsin and maybe even upto Niagara falls all via Road. It was an interesting trip in the end and this is how it went. It is Friday and I had decided to go through with trip. The first step was to go and rent the car from Hertz. Which looked like a 15 minute process took almost 2 hours come through and at a given time during these 2 hours I had decided not to rent the car. However, I was determined to make this happen and was patient to go through the process. Eventually, after 2 hours I was driving out with Sahil driving the Nissan Altima back to the place. The next step was to prepare for other stuff – packing clothes, soda, iPods, tablet, phone wires and anything else. All went well and I finally slept around 11 to be ready to leave around 6 next day. I started the day early on Saturday and had plans to visit 2 places that day – Wisconsin Big Cat Rescue, Circus World and Riverside and Great Northern Railways. I never went to the Circus World and ended up being at the Medellin Park in Chicago. From Big Cat Rescue, I had to back track a few miles to reach the Riverside and Great Northern Railways (bad planning on my part as I did not find out which was first on the route). However, from there on I decided not to go to Circus World and moved on to Chicago. A detailed description of my experiences is in another post here. Once I decided not to go to Niagara Falls, I had to find things I could do on Sunday. Having looked up at what all places Chicago has to offer like the Navy Pier, Sears Tower and a few museums – I decided that those are going to be redundant and not something new. Bhua suggested that we start the day by visiting to a Gurudwara and visit a Dairy Farm and decide what to be done for the second half. I have never been to a zoo in US so decided to visit Michigan City Zoo in Indiana. The first half of the day was pretty good and especially being able to be at the Gurudwara and being able to attend the “Ardas” and have “Langar”. It felt so good, Even the experience to the Fair Oaks Dairy farm was so good – it was a new experience for me and learnt a lot on how things work in a Dairy Farm (just so many cows). The zoo was also nice and a different experience. A detailed description of my experience is in another post here. I woke up late on this day too and was already late for Bhua’s house. So I left the house hurriedly not knowing what was in store for me. Day brought me so many surprises – cops, lead to a deserted industrial area in Indiana, A wonderful house, an exotic trip back on my route to Plymouth and a companion on the road. You can read all of that here. Day 3 started with a hurry. I had not unpacked my bags, but some stuff did have to be packed back. I was late in getting up and was in a hurry anyways. After being late by 30 minutes, I left bhua’s house and was on my way. As I joined the interstate 65 and was running Northbound, it was all fine until the point when my GPS threw me on another state highway. I was not sure why this happened, but was sure this was going to take longer even with so little traffic. But then I saw a truck behind me with lights flashing. And, I knew I was busted for driving fast. This was a first time and I had no choice to pull over. I stopped the car and waited for the cop to come over. He took my license and car rental details and came back after 5 minutes. Then after a few questions like where I am coming from, Where I am going, I was warned that I should slow down. Lucky for my he did not issue me a ticket and let me go. With a sigh of relief, I went on my way only to find myself driving in an industrial neighborhood which was completely deserted. And then I realized what could have gone wrong. And then I turned over to my GPS and saw that I had selected “Avoid Tolls” and thats whay GPS was all over the place “What an Idiot” (for myself). I corrected it and I was back on Illinois Tollways. After another 45 minutes I was at Ashi Bhua’s place. Meeting her was very nice and after another hour I was on my way to next stop. It was 4.5 hours drive from Bhua’s house. 3.5 hours was on interstate I94 from Milwaukee. But then I turned on to another state Highway. With a speed limit of 70mph, it was not crowded at all. I just put the car in cruise and was cruising on the highway all the way. I did have another car with me – a Red Dodge Durango that was around me for almost 70 miles on that route. We were in front of each other overtaking cars and just flying. We parted ways, as I took exit to the house. Section 1 has 3 main attractions – The Gate House; which is the entry to the house, The Infinity Room and then the Original House. As I entered the house my first reaction was “hmmm – this is different” and as I progressed I was just amazed and ended up speechless as I exited the house. I was told to take approximately 3 hours for the entire house, but I guess they under estimate the capability of the house. I was alone and still took like 3 hours; I am sure if I was in a group it would have taken anywhere between 4-5 hours to do the entire thing. I loved this so much that I have dedicated an entire blog entry to this. Read my experience here. As I left I almost made it to the “Cave of the Mounds”, but decided it as it would have meant that I would have reached back home only at midnight. So, I asked my tomtom to take me back home and it sure did. However, it did take me to Maustan instead of the route I took while coming in. First 90 minutes of the drive back home was middle of the Wyoming Valley with twisting and turning roads and steep inclines and declines. It was just so wonderful to drive – I could not have beloved that I was able to experience this just at my last road-trip. Along the route, I passed only 3 towns (believe me – 3 towns in 90 minutes of drive – thats was very new for me) – Paine, Loganville and Reedsburg. They were very small towns and LoganVille has population of just 276 people. The street view of the town even though it was like 300 yards was just so different and pleasing to the eyes. Once I touched the interstate (I94) it was a trip back to home with expected areas and a couple of stops for coffee. However, as I joined the interstate from Black Hills, a Green colored Acura sports car joined me and as we overtook other slow moving traffic. We were next to each other for almost 100 miles – taking turns in leading the way. It all ended up around 10pm as I drove into the parking and rested from a wonderful experience. The house on the rock is a is a complex of architecturally unique rooms, streets, gardens and shops designed by Alex Jordan, Jr. It is located in Iowa County, south of Spring Green, Wisconsin and is a regional tourist attraction. I went there is minimal expectations and it exceeded all of those. Built on top of a mountain the Wyoming Valley, it just goes to show the spirit of its Building Alex Jordan. It just goes to show what eccentric people can do when they put their mind to it. His creation does nothing to the science of mankind, but this is just superb. During the visit my reactions were changing to an awe. The second section just blew me away and I had surrendered to the marvel created by Alex Jordan. The third section was kind of let down compared to the second one, however this section had an awesome collection of Doll Houses, that made it worthwhile. Overall, the third section in the end turned out to be a very good one. The house is divided into three sections and I went for viewing all the three. 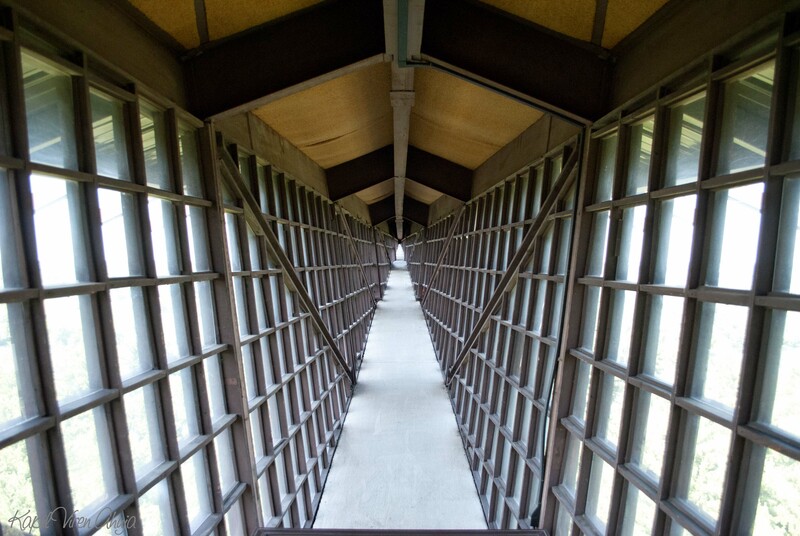 Section 1 has 3 main attractions – The Gate House; which is the entry to the house, The Infinity Room and then the Original House. As I entered the house my first reaction was “hmmm – this is different”. The infinity room was the very first surprise for me in the house. A room made out of glass and some metal (i suppose) suspends over the Wyoming Valley. As you move in the room you can see nothing but the valley and the room moves beneath you. The view, the design of the room itself and knowing that there is only a few centimeters of ground beneath you kind of scares you. In this next section the next few rooms are just designed in a very bizarre way. I am sure Alex would have a reason behind the designs, I just was not sure what it was. But they were different. As I continued with the tour into the next section, I just did not know what to expect. The entry to the section had a Water Wheel, not that was different and it made me believe maybe this section would be different and I was in for a surprise. And, after a little while I moved into “Streets of Yesterday” . And as I entered, I found myself standing in the same place for a minute just trying to understand if this was still a room or did I walk out on a street. It felt like I was back an era and standing in a small town. 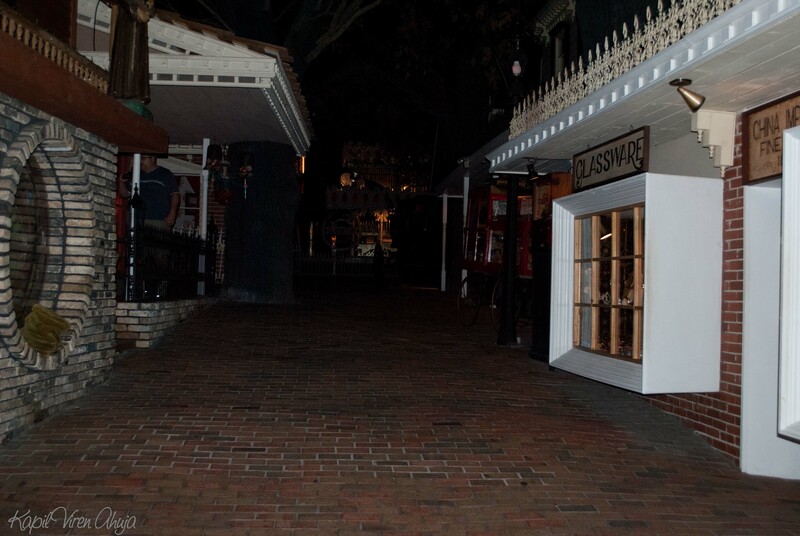 The street had red-brick avenues with a sheriff’s office, carriage house, shops with antiques, a tailor and what not. At the very end of the street there was a huge locomotive engine. What it did make me wonder was what was a locomotive engine doing on a street; looked out of sorts but the engine itself was a big one. The next room was about the sea and called “The Heritage to the Sea” and I was expecting some ships, details about them and models. But, what I saw was a disbelief. It was a three-story room almost size of 4 house in length and in the middle of the room there was a depiction of a sea wave having a Whale in midst of it. 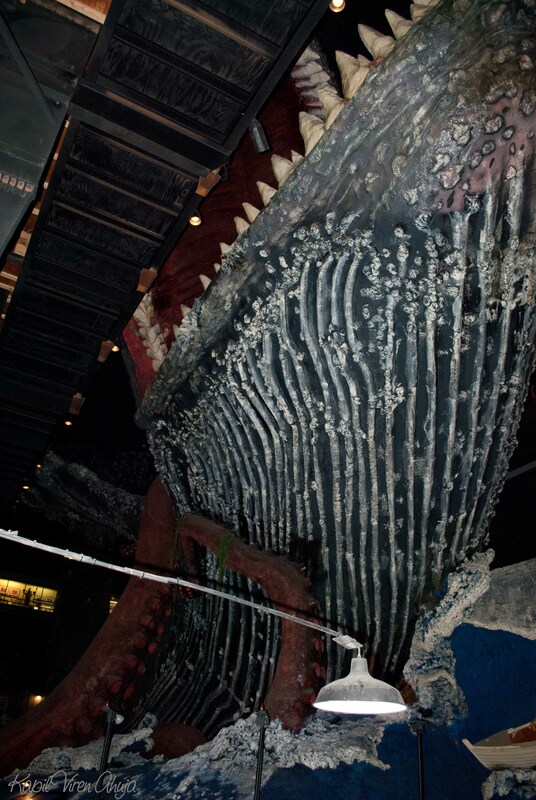 A giant Octopus had itself wrapped around the whale which was getting ready to devour a boat/ship. The room was so big that there was no way that I could have got the whole thing on my camera even with my 18mm wide focal lens on DSLR. You have to got to see it to believe it. The room also had some other very interesting artifacts in it like the charges for the ticket to board the ship, pictures of Titanic sinking (I am sure that was not real because no one took a picture as it sank, but looked real). And various models of ships from 19th century. It was just great. One other thing in that room was a “black hole simulator” (I dont remember what they actually called it); but the idea was that if you drop a coin in it, it will orbit around the hold in the center and simulate a planet/object as it would orbit around the black hole before getting sucked in. I dont know if that is scientifically validated but it was cool. The next few rooms in this section had some modeled airplanes, cars, houses – nothing out of the ordinary. And I guess I realize why this was the case. 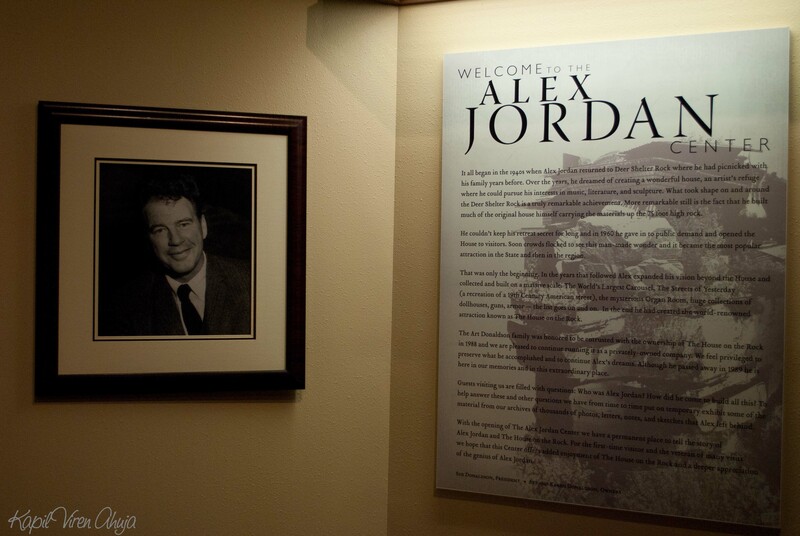 Alex Jordan wanted the visitors to be prepared what was coming next. The next few rooms were a tribute to music and were named “Music of Yesterday”. Just like the “streets of yesterday”, this was another wonder. From one room to another there were music instruments orchestrated to play great rhythms. All of the rooms had a dazzling display of machines and some noticeable ones were included the Blue Room with a mechanically operated orchestra and the overpowering oriental music of the Mikado. Mikado was the best. I put 2 coins; special coins provided at the entrance when purchasing tickets and it started to play music with the Chinese guy in the middle have facial expressions. To top it all, the music felt like it was Dolby effect. It was followed by a room having details on the aviation – it was simple (compared to other stuff) but good. Before you make assumptions, the picture has a bit of artistic touch on it (slow shutter speeds). But The Carousel was simply majestic. 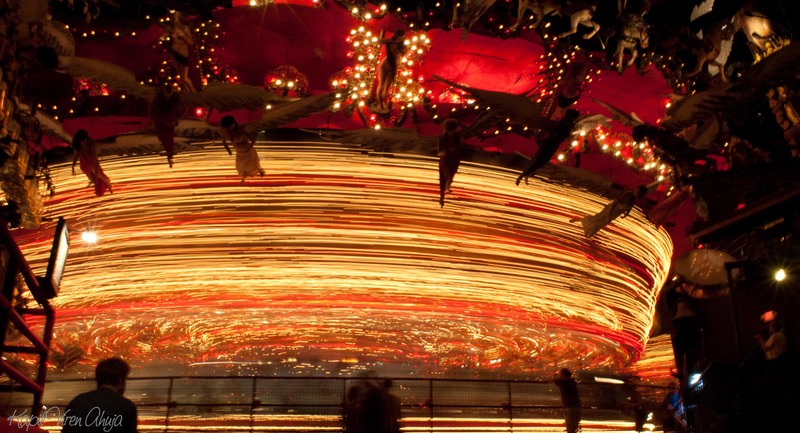 The whole room was lit by the lights from the carousel. In addition to it, there was another set of musical instruments that was playing along and made it such a wonderful experience. This section had many things – large clock with very large bells; a very big ship engine; big organs (not playing nay music); a circus room inspiration point. Most of these were nothing compared to what I just witnessed in the previous section. I guess the previous section things were moving and things were playing music. I felt it was interacting with me. Then this one was just incognito. It was good, but just not as good. 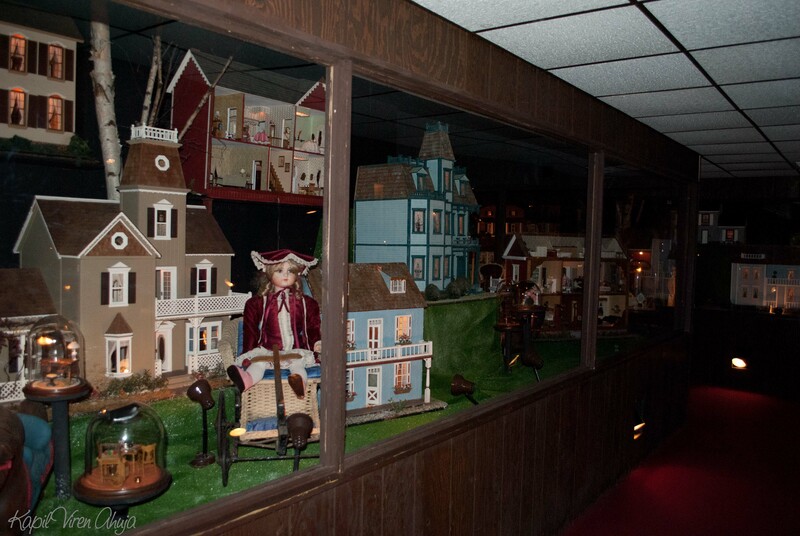 One thing that did make up for the rest of the rooms was the collection of doll houses. Named as “The Doll House Room” it is considered to be the largest collection of doll houses in the world with houses was various era. I just could not believe my eyes as to how much real they all looked. This section just made up for this section. As I was wrapping up the visit to the house, I just was hoping that I see something additional that is extra out of the ordinary. 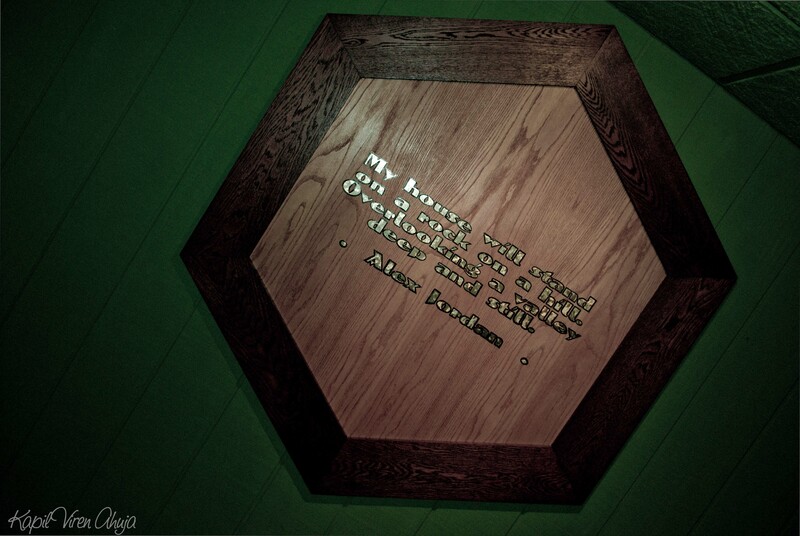 However, Alex had put everything he could think of in this house. As the picture here describes his house, the only thing I do not agree to is “and still”. For me the house was interacting with me as if saying to me “go and tell the world that I exist as a vision from an eccentric and lat people know what Alex did for me (house). I just cant thank enough my Dolly Bhua that she told me about this place and I was able to see such a marvelous place. I did have a regret that I did not know of this place when Preeti and Aabhya were here. 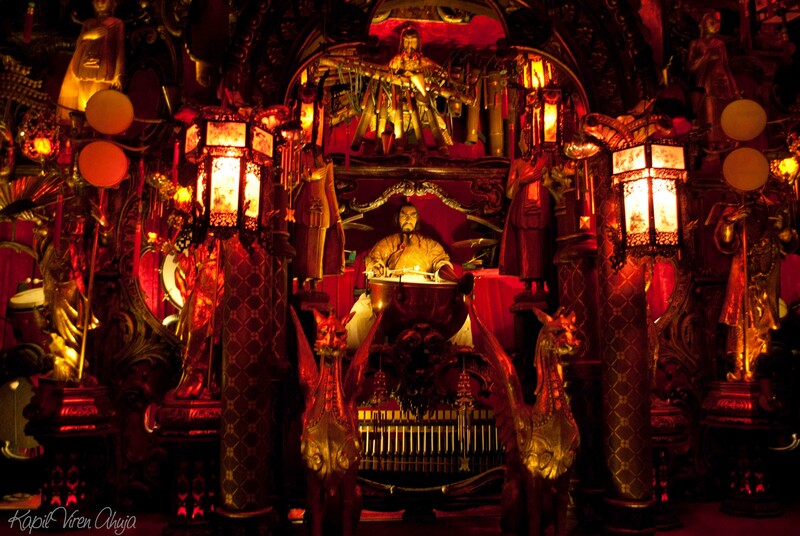 I just hope, I do come back some day with my family and share with them what I experience in “The house on the rock”.